This is a brief excerpt from my upcoming book The Value of Simple: A Practical Guide to Taking the Complexity Out of Investing. It has been edited to stand alone. After you’ve done your planning and are ready to invest you have to set up an account somewhere and implement your plan. For most people passive investing through index funds is the best way to go, but even within that strategy there are many options out there. Two key considerations are the cost of investing and the complexity of the system, which may become a balancing act between the two. Don’t underestimate the value of simple — an easy-to-follow investment plan will pay in the long-term if you’re more likely to stick to it. Though nearly every bank and brokerage provider will have some form of account and fund for you to invest in, three excellent options using low-cost index mutual funds or exchange-traded funds (ETFs) are at Tangerine, TD Direct Investing, and Questrade. Each one provides greater cost savings at the trade-off of increased complexity. In my opinion, TD Direct Investing and their e-series index mutual funds represents the best balance between cost savings and effort required. This is not because I receive any kind of compensation from TD, but rather because I truly believe that the e-series index funds are the hands-down winner for investors starting out. They offer the ability to invest in passive stock and bond indexes, in non-registered, TFSA, RESP, and RRSP accounts, with low MERs on the funds and (if you satisfy certain conditions) no other annual fees. Then they are not much more expensive for ETFs when your account grows larger and you’ll already be familiar with the platform. Tangerine (formerly ING Direct) is a good option for people with smaller accounts. Things are even easier than TD with their investment funds: all you have to do is pick from one of four basic asset allocations, and they will take care of the rebalancing — and they will even help you decide on your asset allocation through a questionnaire. Just make your regular contributions to the fund you’ve chosen, which you can easily automate with a pre-authorized payment plan. There are no extraneous fees beyond the MER. Tangerine is, simply put, as easy as investing gets without paying a commission to have a salesperson do it for you. The simplicity is great, but the MER of the Tangerine funds is more than double that of the TD e-series funds (yet still half that of typical funds). As your assets grow, this cost difference will become more noticeable. At the hundreds-of-thousands level, you’d be able to go with a fee-based advisor who would use index products for you for a similar fee. 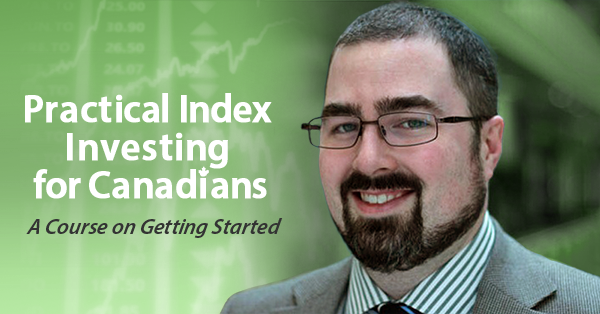 For the absolute cheapest option, commission-free ETFs at Questrade can’t be beat. You pay nearly nothing to buy, and a small commission to sell (about $5-10 per trade, depending on how much you’re selling). And the on-going MER of the ETFs is as low as you can possibly get for investments. 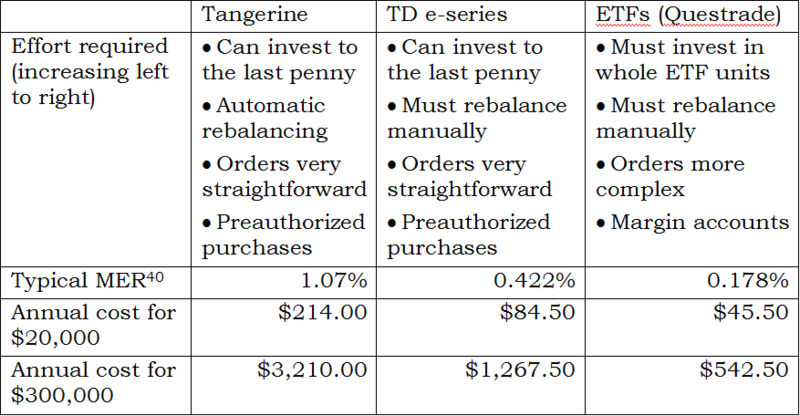 However, the order-entry process is a fair bit more complex than with the mutual funds for Tangerine and TD, and you have to deal with rounding off to whole units rather than just investing a given dollar amount. There are many other options available: every major bank has an associated discount brokerage arm where you can buy the same ETFs available at Questrade or TD Direct Investing; some banks and mutual fund companies offer relatively low-cost funds that are competitive with Tangerine’s. These three options, however, are the archetypical combinations of low fees and convenience at various points along the trade-off. I will provide step-by-steps for using each, along with general information for buying ETFs at brokerages other than Questrade. Footnote from the table: 40. Assuming 25% in each of a bond fund, Canadian, US, and International equities. For dollar comparisons, assumes $10 in commissions per year. If you decide to shift to ETFs and want to stay with TD Direct Investing, assume that you will have about $40/yr in additional commissions over Questrade. Rounded to 3 significant figures. 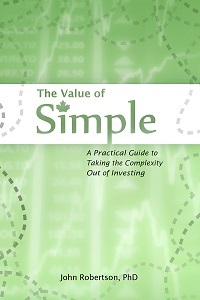 This has been an excerpt from The Value of Simple, a how-to guide to index investing for Canadians coming out December 1, 2014. If you’re interested in opening a Tangerine or Questrade account, I have referral codes in the sidebar which will provide both of us with a bonus. The costs of fundamental indexing has always been an issue for me. It certainly sounds good — and if I could get it for free I’d be all over it — but with most real-world implementations costing 0.5-1% more than really low cost cap-weighted index funds/ETFs it’s hard for me to make the leap. Either way though you’re in the right ballpark and should do fine! Yeah, the cost issue is a big one. Proponents of course argue that fundamental indexing outperforms cap-weighted indices by something like 1-3% in developed markets and signficantly more for emerging markets. So if that’s true, the higher MER might still be worth it. Or so goes the hope. Bogle is skeptical though, and I tend to agree with every word that leaves that guy’s mouth. I might throw the dice on a fundamental index ETF for emerging markets, but I’m very likely better off just sticking with Vanguard, etc. and controlling the things I can control. Enjoy your blog. Cheers.